Before I found my love for photography, I had found a love for fashion photography. I'm not even sure that at the time I was aware of the fact but I remember flipping through the pages of the high fashion magazines and my mom asking me why I would buy such a magazine bc it was just full of ads, but that was the point. I loved the colors, the make-up, the clothes, the props, the odd poses, the dramatic lighting. Looking back now, was it really the fashion, or was it just the way fashion photography was approached that made me lust over it? Either way, as I got older, I had a strong yearning to combine the two worlds myself. Actually, one of the first organized photo shoots I ever did with my friends was, what we thought at the time, a high fashion setting. I did everyone's hair in a huge, backcombed manor, my friend supplied the wardrobe- her grandma's old sheer night gowns, and we posed in an old factory that I was currently using for studio space. If nothing else- it was fun!! Once I started getting more and more into photography, any scenario I wanted to create was usually based off something I had seen in a magazine- odd posing, crazy hair, odd combinations of clothes, etc. I did a 1 yr project called a 365, which forced me to take a self portrait everyday for an entire year which allowed me the opportunity to express a lot of the ideas I had, but only on myself. Sadly, as I got more and more into the professional side of photography, I was dealing with and thinking about fashion less and less. Sadly, this city doesn't allow for a lot of creative outlets and is not in high demand for anything outside the box. Anything I wanted to create that related to fashion was merely for fun and as personal time got less and less available, paying jobs outweighed the fun jobs. 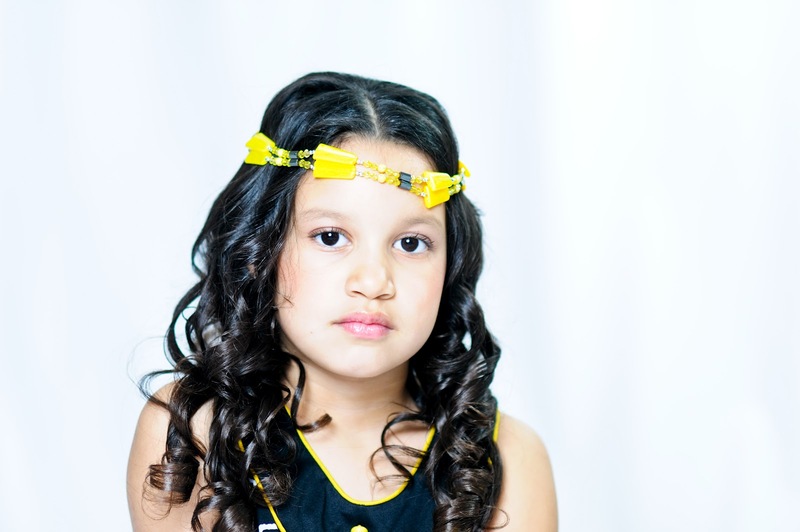 Hannah is 6 yrs old and has been modeling for most of her life. To say she is a born natural is an understatement. 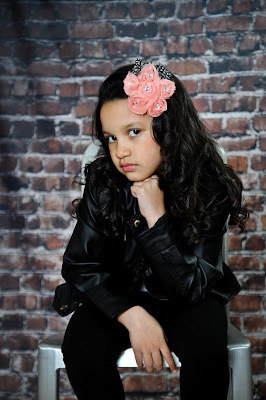 Her mother contacted me looking for someone to photograph her daughter wearing items that boutiques, online stores, magazines, etc send her in return for photos that they can then use as advertisement on their website, stores, etc. Of course I was ready to take on the offer! Modeling, Photography, Fashion, and Publication. WHY would I say no? Now, her mother had warned me that I wouldn't need to tell Hannah what to do, how to pose, or keep her focused. 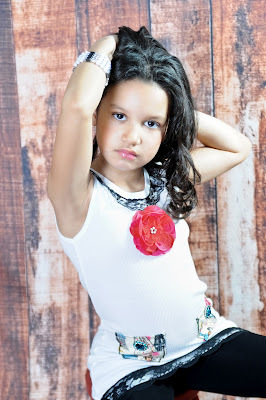 I believed her, on the level and understanding that she was used to modeling, but she was also 6. Then they came for their session. Not telling her how to pose or what to do, was, again, an understatement. Not only was she super cute just to talk to, but right away, she was ready to work. She posed with an innocent smile, and then would give you a fierce straight face two seconds later. Right away I realized, she knows what she is doing and we are going to rock this! We had about 8 items that we needed to shoot and managed to do so in little over 1 hour. Shirts, head bands, extensions, hats. I am so thankful that my past sessions and previous clients have lead Hannah-Mae and her mom to me at A.J.B.C. Finally, after all these years, I feel like I am heading in a direction with my photography that I have a pure passion for. Don't misunderstand, I love my classic family portraits and kid sessions, but there is just something about fashion that gets me excited. It may be bc, for a few shutter clicks, you get to create a scene any way you prefer and there's edge to it, it doesn't have to make sense, and your subject is purposefully morphing into someone new. Or maybe it's bc we walk around everyday being who we are and for one short session we're allowed to put on a new face, bare a new attitude, and experience what it's like to live as somebody else, without being judged, before we then have to wipe off the make-up, put our regular clothes back on, and transform back into ourselves right before we walk out that door.